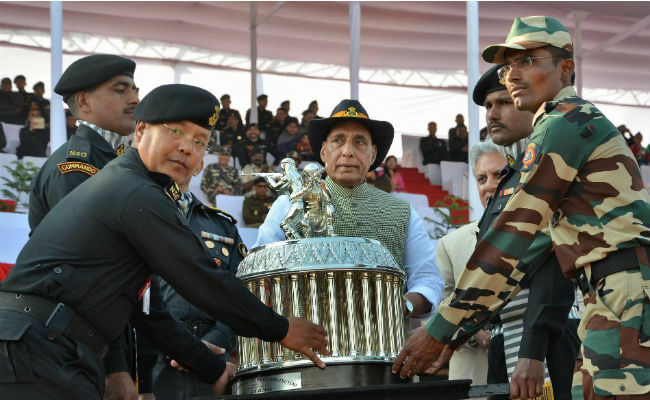 Home Minister Rajnath Singh was addressing the closing ceremony of the 8th All India Police Commando Competition at the National Security Guard garrison in Gurgaon near Delhi. New Delhi: Security agencies' personnel, including those from special commando forces such as the National Security Guard or the NSG, should be trained in tackling the emerging "fourth dimension" of threats of cyberattacks, Home Minister Rajnath Singh said. Addressing the closing ceremony of the 8th All India Police Commando Competition at the National Security Guard garrison in Gurgaon near Delhi, Mr Singh said hacking websites and data leaks also indirectly imperil the national security. Cyber space is now emerging as the fourth dimension to the threats to our national security, and commandos should also train to eliminate these threats, apart from conventional forms of threats, he said. The minister said the "iron fists of the commandos of various forces and the NSG can sniff out any evil eye casting aspersions on our soil." "A commando is not only physically agile and deft in firing weapons but it is the composed mind-set to make threat assessment and application of one's resources to overcome the threat that gets into making a commando out of a soldier," he said. He lauded the NSG and said the nation was proud of them and they have proved their mettle during the Parliament attack of 2001, Akshardham temple attack the following year, and the 2008 Mumbai terror attacks and the recent Pathankot attack. The NSG was declared the overall winners of the competition, in which a total of 25 teams from the central paramilitary and state police forces participated over the past five days.